To Cite: Ataee R A, Kashefi R, Alishiri G H, Esmaieli D. Assay of Blood and Synovial Fluid of Patients With Rheumatoid Arthritis for Staphylococcus aureus Enterotoxin D: Absence of Bacteria But Presence of Its Toxin, Jundishapur J Microbiol. 2015 ; 8(12):e28395. doi: 10.5812/jjm.28395. Background: Rheumatoid arthritis (RA) is the most common chronic inflammatory disease. The staphylococcal superantigens are considered as the causative agent of RA disease. Objectives: This study aimed to assess the presence of staphylococcal enterotoxin D in synovial fluid and blood of patients with RA. Patients and Methods: A total of 120 blood and SF samples of patients with RA were studied. Bacterial culture, primer pairs design, polymerase chain reaction (PCR), and enzyme-linked immunosorbent assay (ELISA) methods have been used to assess of the staphylococcal enterotoxin D. The data were analyzed through descriptive statistics. Results: During this study and after sequential subcultures, only 5 bacterial strains were isolated. The results of PCR showed the presence of staphylococcal enterotoxin D gene in almost 50% of SF and also in 48.4% of blood samples of patients with RA. Similarly, the ELISA method detected staphylococcal enterotoxin D in 36.16% of SF and in 33.33% of blood of patients with RA. Conclusions: The result of this study showed that a high percentage of patients with RA have shown staphylococcal enterotoxin D (superantigen D) or entD gene in SF and in blood. However, the origin of this superantigen was not clarified and no Staphylococcus aureus enterotoxin D producer was isolated. This finding indicates other role of this superantigen besides its intoxication. Therefore, staphylococcal enterotoxin D as a biomarker may provide a good model for the diagnosis and treatment of patients with RA. Staphylococcus aureus, a common pathogen associated with serious community and hospital acquired disease produce several enterotoxins causing food poisoning and also act as superantigens (SAgs) which stimulate T-cell proliferation and inflammatory cytokines production (1). Currently, more than 20 staphylococcal enterotoxins with superantigen activity have been identified (2). These superantigenic enterotoxins are increasingly recognized for their possible roles in human diseases such as atopic dermatitis, Kawasaki syndrome, nasal polyposis, and certain autoimmune disorders such as rheumatoid arthritis (RA) (3). A study has shown that patients with RA had increased levels of serum IgM staphylococcal enterotoxin B (SEB) antibody compared with normal subjects (4). A published research on microbial mechanism in RA discussed 3 important hypotheses: microbe is present and still accessible, microbe is present but hidden, microbe is absent but perpetuated by the immune system (5). Also molecular mimicry could be the mechanism operating in RA disease as endogenous origin cases. As regards, to clarify the role of staphylococcal SAgs in RA, it is necessary to assay more profoundly. The results of in vitro study demonstrated that the wide spectrum of human diseases caused by staphylococcal SAgs interact with 3 host immune cell receptors: variable regions of the beta-chain of the T cell receptor; MHC class II alpha, and or beta-chains; and epithelial/endothelial cell receptors (6). However, the immune response to SAgs of S. aureus is poorly understood and assays conducted based on antibody against SAgs detection in human body fluids may be misleading. Because staphylococcal superantigen as hyperstimulate the T-cell-mediated immune response and then magnitude inducing inflammatory cytokine storm was taken out (7) before antibody production. Thus, more research was focused on toxins (SAgs) production of S. aureus strains isolated from clinical and food samples. In addition, the enterotoxin-producing coagulase-negative staphylococci (CNS) isolated from CSF of patients (8) and also from bovine milk (9) created new prospects for investigating inflammatory diseases. Furthermore, the prevalence of genes encoding erythromycin ribosome methylase and enterotoxins in S. aureus isolated from blood stream infections were reported (10). However, no study has been conducted on staphylococcal enterotoxins detection in blood or synovial fluid of patients with RA so far. In some cases of inflammatory chronic diseases such as rheumatoid arthritis no bacteria growth was shown. Meanwhile, we assume that the existence of superantigens in the body fluid of patients may have endogenous origin, because in previous studies, the existence of S. aureus enterotoxins in patients’ synovial fluid with RA was demonstrated (11, 12). Moreover, superantigens produced by S. aureus are considered as major arthritogenic factors (13). Thus, the objective of this study was to assay simultaneously the staphylococcal enterotoxin D in the blood and synovial fluid of patients with RA. A strain of S. aureus, contained the entD gene, produced enterotoxin D, and isolated from the clinical samples, was characterized as gen bank reference (M2852.1) and used as standard strain (14). By using online Gene script software, the primer pairs were designed on the basis of the reference sequence (S. aureus enterotoxin D complete gene, accession number M2852.1) and then analyzed by primer3 software. In addition, multiple alignments were carried out by DNASIS MAX trial version. The final sequence of designed primer pairs was as follows: F- GAGGTGTCACTCCACACGAA and R- CGGGAAAATCACCCTTAACA. From April 2011 to August 2014, a total of 120 bloods and synovial fluid samples of patients with RA were collected by an expert rheumatologist. Inclusion and exclusion criteria of the patients with RA were based on American college of rheumatology (ACR) 2010 criteria (15). This project was approved by ethics committee of Baqiyatallah University of Medical Sciences on November 29, 2011 (Code No: 24 Paragraph 28). In aseptic conditions, the blood sampling was carried out. In brief, after disinfecting sampling site, 5 - 10 mL blood was aspirated by a syringe. Then, 3 - 5 mL of blood was inoculated into Castaneda medium (Bahar Afshan Co. Tehran Iran) and was incubated at 37°C for 48 hours. Afterward, 2 mL of collected blood was added to sterile CBC tube and the remainder to clotting tube for preparation of serum and plasma, respectively. Synovial fluid (SF) sampling was carried out using the standard protocol. About 5 - 10 mL of SF was aspirated by an expert rheumatologist. Immediately afterwards, 3 - 5 mL of SF was inoculated onto Castaneda medium and incubated at 37°C for 48 hours. The remaining SF was aseptically subjected to DNA extraction and stored in the freezer at -80°C. After inoculating in Castaneda medium at 37°C for 48 hours, 1 mL of Castaneda medium was aspirated and subcultured on blood agar plate at 37°C for 24 hours (Blood Agar Base, CONDA, SA). Afterwards, the isolated bacterial strains were characterized by using colony characteristics, Gram staining, and biochemical tests. To perform the PCR protocol, the bacterial standard strain was inoculated into the 5 mL of Broth medium (Merck, Germany) at 37°C for 24 hours. The bacterial suspensions were centrifuged, and cellular sediments were obtained. Then, the DNA extraction was done using modified salting-out method (16). In aseptic condition, patient’s blood was added to CBC tube and centrifuged (10 minutes, 7000 × g, at 4°C). Then blood buffy coat was extracted and transferred to DNA free sterile tube. Separately, 100 µL of each of the blood buffy coat genomes was extracted by CinnaPure-DNA Extraction Kit (CinnaGen Co. Tehran, Iran). Following the kit instructions, 100 µL of blood buffy coat was added to the kit microtube, and then 400 µL of lysis buffer was added to it and vortexed for 20 seconds. Next, 300 µL of precipitation solution was added to microtube and again vortexed for 5 seconds. In this stage, all microtube components were transferred to the column, and centrifuged (1 minute, 5°C, 13000 × g). Afterwards, the column was transferred to a new microtube and washed by 400 µL of washing buffer 1, and again centrifuged (1 minute, 5°C, 12000 × g). Next, for the second time, the column was transferred to the other new microtube and washed by 400 µL of washing buffer 2, and again centrifuged (1 minute, 5°C, 12000 g). After drying and changing the column, 30 µL of elution buffer was added and centrifuged (5 minutes, 12000 × g). Finally, the DNA quality and quantity was measured by NanoDrop (Thermo Scientific NanoDrop 2000 Spectrophotometer USA). Similarly, the serum and plasma of patients were subjected to DNA extraction by this method. Free DNA tubes containing 500 µL of patient’s SF and 500 µL of free DNA distilled water (DW) (mixed in aseptic conditions) were centrifuged for 1 minute at 3000 × g at 4°C. Afterwards, the resulting supernatants were transferred to DNA free sterile tubes and the genomes were extracted with the CinnaPure-DNA extraction kit (CinnaGen Co., Tehran, Iran). Following the kit instructions, 200 µL of diluted SF was added to the kit microtube, and then 400 µL of lysis buffer was added to it and the mixture vortexed for 20 seconds. Afterwards, 300 µL of precipitated solution was added to the microtubes and vortexed again for 5 seconds. During this stage, all microtubes contents were transferred to the column and centrifuged for 1 minute at 13000 × g at 5°C. The column was then transferred to a new microtube and washed by 400 µL of washing buffer 1, and again centrifuged at 12000 × g at 5°C for 1 minute. The resulting solution was transferred to the other new microtube and washed by 400 µL of washing buffer 2, and again centrifuged at 12000 × g at 5°C for 1 minute. After drying and changing the column, 30 µL of elution buffer was added and the solution centrifuged for 5 minutes, at 12000 × g at 5°C. Finally, in each case, the DNA quality and quantity were measured with the NanoDrop 2000 spectrophotometer (Thermo Scientific, Wilmington, DE, USA). Detection of enterotoxin D gene protocol was performed by using the specific primer pairs which amplified a 294 bp fragment based on the standard strain genome. 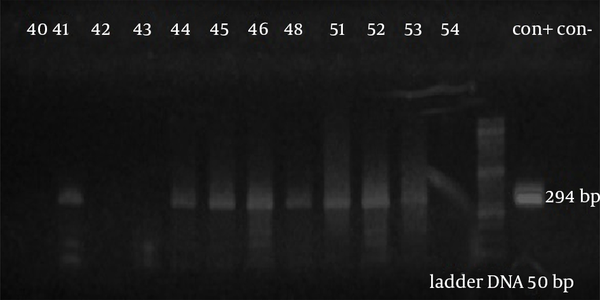 For DNA amplification, the master mix was made in 200 μL microtubes by using a 25 μL reaction mixture that contained 1 μL DNA template (50 ng/μL), 0.3 U of Taq DNA polymerase (1 μL), 2.5 μL of 10X PCR buffer, which contained 0.16 mM of each dNTPs, 2 mM MgCl2 (all reagents were from CinnaGen Co. Tehran, Iran), 1 μL (10 µmol) of the primer pairs (synthesized by CinnaGen) and double-distilled water, to a final volume of 25 μL. All amplifications were carried out in a thermal cycler (Bio-Rad, C1000, USA) with initial denaturation at 95°C for 3 minutes followed by 35 cycles of denaturation at 94°C for 30 seconds, primer annealing at 61°C for 40 seconds and extension at 72°C for 40 seconds, followed by a final extension at 72°C for 5 minutes. 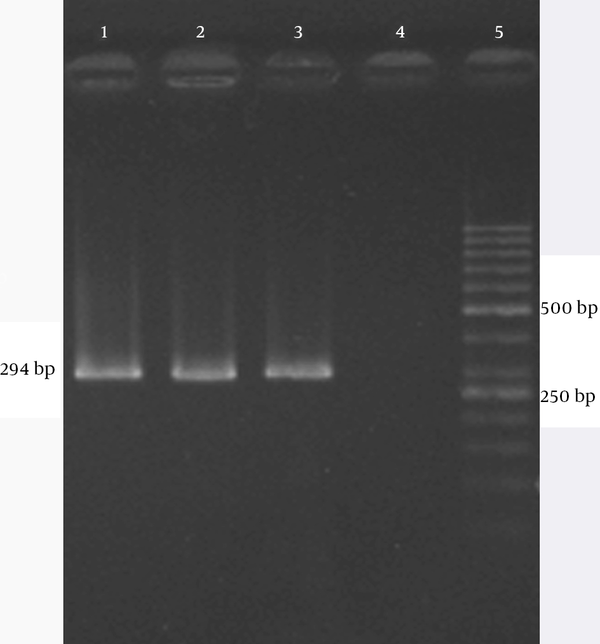 The amplified PCR products were electrophoresed in 1.5% agarose gel for 45 minutes, and then stained with ethidium bromide for 20 minutes (0.05 mg/mL; Sigma Aldrich). The gels were photographed under ultraviolet light using Gel Doc (Bio-Rad Universal Hood II, USA). Also, molecular size markers (50 and 100 bp) were included in each agarose gel. Finally, all samples of buffy coat genomes were assayed by the optimization PCR. For validation of the enterotoxin D existence in patients’ blood and synovial fluid samples, the indirect ELISA was used. To this effect, patients’ serum from CBC tube was centrifuged (10 minutes at 7000 × g), taken out, and assessed by ELISA as follows: Based on the previous report (11), 50 µL of patients’ serum with the 50 µL of distilled water as diluents was mixed. Then, they were added to the defined wells of ELISA plates that were previously coated with polyclonal monospecific antibody against staphylococcal enterotoxin D (Rb PAb Staphylococcus enterotoxins D 15900 500 lot 693316 abcam). After one hour incubation and 3 times washing, 50 µL conjugate antibody was added. Then, enzyme substrate and finally, 100 µL stopping solution was added. After 10 minutes of this process, the color would change. Next, the wells absorption was measured by the ELISA reader device in 450 nm wavelength and the cut off value was calculated for each plate. The results of bacteriological studies of each 120 SF and blood samples from patients with RA during this research and after sequential subcultures revealed that only 5 bacterial species were isolated from blood of patients with RA. Based on the results of biochemical tests; just one isolate as S. aureus was detected and others as S. epidemidis, S. intermedius, and two isolated strains were Gram-negative bacteria as Pseudomonas putida and P. aeruginosa. The quality and quantity results of assay from reference bacterial strain and patients’ sample genomes have been characterized by NanoDrop device (the ratio of 260/280 nm ≥ 1.7 was as desirable scale) and gel electrophoresis (the agarose gel concentration 0.8%, at 100 V for 45 minutes), respectively. The results revealed that primer design sequences was amplified a 294 bp amplicons as PCR products. Based on the reference strain genome and master mix components, PCR was optimized and applied as a positive control. The results of amplification of the positive control with amplifier primer a 294-bp fragment amplicon are shown in Figure 1. Lanes 1, 2, and 3, amplicon 294 bp of positive control; Lane 4, negative control and Lane 5 is a 50 bp MW standard. The assay findings of 120 patients’ samples with RA showed that the PCR technique was able to detect entD gene in 60 (50%) and 45 (37.5%) cases of patient’s synovial fluid and blood buffy coat, respectively. Figure 2 shows the result of PCR product electrophoresis of several synovial fluid samples of patients with RA. The amplicon 294 bp fragments for a number of SF samples were characterized and sequenced. Lanes 41, 44, 45, 46, 48, 51, 52, and 53, the positive results; Lanes 40, 42, 43, and 54, the negative results. In addition, the 50 bp MW ladder, and positive and negative controls are shown. The results of ELISA test showed the presence of staphylococcal enterotoxin D in 47 (36.16%) cases of SF and 40 (33.33%) cases of blood buffy coat. The comparative total results of PCR, ELISA, and bacterial culture are illustrated in Figure 3. Detection of superantigens in inflammatory and autoimmune diseases such as RA has been already considered. The research results revealed that staphylococcal enterotoxins are known as classic superantigen. So far, more than 20 different serological types of superantigens from S. aureus strains have been identified (17). Superantigen roles in the development of arthritis in experimental animals such as DBA/1J mice have been demonstrated (18). The results of another report showed that the superantigens and also Gram-positive bacteria peptidoglycan stimulate T cells for cytokine and autoantibody production and could trigger vasculitis (19). In a study, the methicillin resistant S. aureus as a septic arthritis agent was reported in a 16-year young man (20). Multiplex real-time PCR reported the detection of cpn60 gene (of kingella kingae) and spa gene (of S. aureus) in SF suspected septic arthritis (21). Recently, a heterometallic-thiol compound, AURANOFIN, as an effective drug against methicillin resistant S. aureus was licensed by FDA for the treatment of patients with RA (22). The results of this study have confirmed the role of S. aureus in the development of RA disease. The results of another study revealed that intravenous administration of S. aureus strains such as ATCC 19095 SEC+, N315ST5 TSST-1+, and ATCC SEA+ could cause progressive arthritis in mice (13). On the other hand, the results of the research showed the staphylococcal superantigens arthrogenicity activity. Furthermore, an investigation result has shown the localized or dissemination infection caused septic arthritis in mice (23). Three cases of dissemination of S. aureus infections have been reported in patients with rheumatoid arthritis (24). Moreover, patients with septic arthritis have been cured by azithromycin in combination with riboflavin (25); in fact, the study result demonstrated the role of superantigens in the development of arthritis. In the last decade, bacterial infections were reported as the etiology of the RA disease (26), but attempts to isolate the organism failed and in some cases it was necessary for the diagnosis of the histopathological findings (27). Since then, numerous studies have focused on superantigens and their cellular targets (28) that indirectly demonstrate the role of S. aureus superantigens as the etiology of RA. For example, treatment of cell lines with staphylococcal enterotoxins are associated with increased production of inflammatory cytokines and development of RA. Therefore, scientists were urged to use numerous immunochemical tests on synovial fluid of patients with septic arthritis and or rheumatoid arthritis in their studies (29). In addition, in order to study the pathogenesis of rheumatoid arthritis the activation fibroblast as target cells for S. aureus was investigated (30). In the meantime, several researchers designed experimental mice models for the study of S. aureus enterotoxin B effects on arthritis induction (18). However, these studies did not explain the ability of other S. aureus enterotoxins. Moreover, they showed that the blood and synovial fluids polymorph nuclear leukocyte of patients with RA were unable to phagocyte and kill intracellular S. aureus (31). However, no evidence is available confirming of staphylococcal enterotoxins involvement in the pathogenesis of RA. Even, there is a report that discussed the lack of evidence for the role of staphylococcal enterotoxins in RA pathogenesis (32). However, some reports indirectly support this relationship. For example, detection of S. aureus infection was reported in 3 patients with RA (24). In addition, result of a study has shown that the concentrations of IgM against S. aureus type B enterotoxin have increased in the blood of patients with RA. Although many studies have demonstrated the role of staphylococcal enterotoxins as classic superantigen induction of RA, there is no recent study that directly detects the S. aureus superantigen in SF or blood of patients. However, currently the laboratory diagnosis of RA is based on test data for CRP, ESR, RF, antiCCP, or radiography (33). Therefore, this study was designed to detect one of the common staphylococcal superantigen genes along with enterotoxin protein in blood and synovial fluid of the patients with RA. In fact, samples of SF and blood of patients with RA were simultaneously assayed. As it was shown in Figure 3, the enterotoxin D gene (entD) or the protein enterotoxin D (SED) can be traced in almost half of the samples of SF and blood of patients with RA. Notably, the PCR method could detect staphylococcal enterotoxin D gene in almost 50% of SF and in 48.4% of blood samples of patients with RA. Similarly, the ELISA method was able to detect the staphylococcal enterotoxin D in 36.16% of SF samples and in 33.33% of blood samples of patients with RA. Despite much research on the role of superantigens in inflammatory disease, no similar study was reported in the literature. In other words, there is no research which demonstrated the tracking of staphylococcal enterotoxins, including enterotoxin D in blood or synovial fluid of patients with rheumatoid arthritis. Just one study has shown the increase serum levels of IgM against staphylococcal enterotoxin B (4). The result of another study has shown that patients with RA had colonized S. aureus in their noses and had high levels of antibodies to toxic shock syndrome toxin 1 (34). Most importantly, the results of bacterial cultures were negative but the encoded staphylococcal entD gene and also enterotoxin D protein were detected in SF and blood of patients with RA. 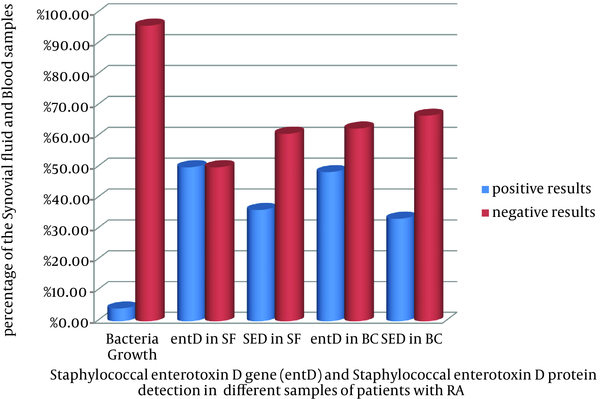 In conclusion, the result of this study showed that a high percentage of patients with RA have shown staphylococcal enterotoxin D (superantigen D) or entD gene in SF and in their blood. However, the origin of this superantigen was not clarified and no S. aureus enterotoxin D producer was isolated. This finding indicates other role of staphylococcal enterotoxin D (besides its intoxication) as one of classical superantigen in the pathophysiology RA. Thus, the results of this study may provide specific and appropriate diagnosis and cure for some patients with RA. Given the importance of this topic, it is suggested that an accurate and rapid method of identifying the SED in SF and blood of patients with RA be designed. Hence, further studies with larger sample size are needed. Also because of a relative lack of available information in these areas, it is recommended that the interaction between clinicians and laboratory specialists for the molecular detection of staphylococcal superantigens in SF or blood of RA patients be encouraged. In sum, staphylococcal enterotoxin D as biomarker may provide a good model for the diagnosis and treatment of patients with RA. The authors would like to thank the Deputy of Clinical Development Medical Center of Baqiyatallah Hospital for their helps and we would like to thank Dr Jamal Akhavan for his financial support and Dr Reza Golmohamadi for his help on the DNA extraction. Authors’ Contribution: Ramezan Ali Ataee developed the original idea and the protocol. Gholam Hossein Alishiri selected and provided synovial fluid sample of the patients. Ramezan Ali Ataee and Reyhane Kashefi designed the experimental protocols, extracted the data, and prepared the manuscript. Davoud Esmaieli as the molecular consulter of this research read the final version of the manuscript. Funding/Support: This project was partially supported by Baqiyatallah University of Medical Sciences.